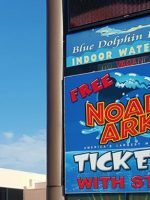 We have visited a number of resorts in the Wisconsin Dells and we believe this is the Dells’ best large resort for toddlers and preschoolers. Older kids will find plenty to enjoy — especially with the sprawling water park and bling-y arcade — but it’s the younger ones who will be most excited by the atmosphere and activities. They love the evening programs in front of the giant lobby clock, the woodsy decor, seasonal fun, ice-cream-themed kids’ spa, and the many ways they cater to children. It’s a formula that obviously works since this resort sparked the Great Wolf Lodge chain that now includes a dozen family-focused resorts across the country. Highlights include an 80,000-square-foot indoor water park with funnel slide, wave pool and tube slides; an animated song and story hour each night in the lobby; Magic Quest, an interactive game with computerized wands to activate wizards, fairies and dragons. ; bubblegum-scented shower gel in each room and an ice-cream-themed spa experience for kids (plus a grown-up one for parents); family suites with wolf-dens, a room within a room that has woodsy-themed bunk beds and TVs; playful decor with lights and objects that can activated by Wizard Quest wands; seasonal programming and crafts; and kid-friendly dining. What else can any family ask for? While this resort is big with 436 rooms, it’s less overwhelming than the Dells’ largest resorts. It’s manageable and easy to navigate. The resort also excels at seasonal decor — especially when it comes to kids whose eyes still sparkle at the mention of Santa. The entire lobby becomes a Christmas village in December complete with snow. Bottom line: Great Wolf is a kickback, easy getaway any time of year for burrowing and enjoying your cubs — especially in winter when cabin fever hits. With the entire lodge catering to the family audience, it's all kid-friendly with 11 styles of hotel rooms from basic double queens to seven-person Kids Cabins. 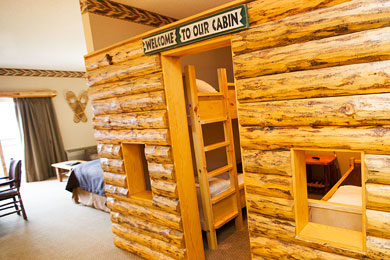 Some have whimsical decor, as well, and the Wolf Den Suites with bunk beds in cave-like rooms are especially popular. There also are lofted units that let mom and dad sleep upstairs and enjoy extra privacy. Rooms include microwaves, mini fridges, flat-screen TV with pay-per-view, High-speed wireless Internet, coffee makers and vanilla-scented soaps and bubblegum-scented bath gel. All but a handful of rooms also include a balcony or patio. There also are four condo styles including a reunion-friendly one sleeping up to 16 people. Condos include full kitchens while hotel rooms have a wet bar and microwave for prepping small meals and snacks. Some condos also have a washer and dryer. The Double Queen Sofa Suite sleeps four people, with a maximum of six. There are two queen beds, a full-size sleeper sofa, a flat-screen HDTV and a private balcony or patio. The room is equipped with a microwave, fridge, coffee maker and hair dryer. The Double Queen Suite sleeps four people and has two queen beds, a flat-screen HDTV and a balcony or patio. The room is equipped with a microwave, fridge, coffee maker and hair dryer. The Family Suite sleeps four, with a maximum of six people. The room has two queen beds, a full-size bath, living area with a full-size sleeper sofa, a flat-screen HDTV and a balcony or patio. The room is equipped with a microwave, fridge, coffee maker and hair dryer. Family Fireplace Suites also come with fireplaces. The King Sofa Suite sleeps four and has a king bed, a full-size sleeper sofa, a flat-screen HDTV and a balcony or patio. The room is equipped with a microwave, fridge, coffee maker and hair dryer. This room is handicap accessible. The Wolf Den Suite sleeps four, with a maximum of six. The room has a cave-themed sleeping area with a bunk bed and TV. The main area has a queen bed, a full-size bath, full-size sleeper sofa, a flat-screen HDTV and a balcony or patio. The room is equipped with a microwave, fridge, coffee maker and hair dryer. The KidCabin Suite sleeps six, with a maximum of seven. The room has a cabin-themed sleeping area with a bunk bed, day bed and TV. The main area has a queen bed, a full-size bath, full-size sleeper sofa, corner fireplace, a flat-screen HDTV and a balcony or patio. The room is equipped with a microwave, fridge, coffee maker and hair dryer. 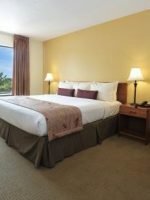 Top-of-the-budget premium suites provide more room and suite options, including whirlpool suites, which only accommodate two people and are not good for families. The Royal Bear Suite sleeps four people, with a maximum of six. There is a master bedroom with king bed. The main area has a queen bed, full-size sleeper sofa, full bathroom, flat-screen HDTV and private balcony or patio. The room is equipped with a microwave, fridge, coffee maker and hair dryer. The Loft Fireplace Suite sleeps six people, with a maximum of eight. The main floor has two queen beds, full bath, two flat-screen HDTV's, a living area with full sleeper sofa and gas fireplace. Upstairs is a queen bed, flat-screen HDTV and the option for a half bath. There is also a balcony or patio. The room is equipped with a microwave, fridge, coffee maker and hair dryer. The Majestic Bear Suite sleeps six people, with a maximum of eight. The master bedroom has a king bed and flat-screen HDTV. The main area has two queen beds, full sleeper sofa and flat-screen HDTV. There is also a private balcony or patio. The room is equipped with a microwave, fridge, coffee maker and hair dryer. Condo suites provide more options for larger families and families preferring room to spread out, as well as kitchen, dining and living areas. The Lone Wolf Condo sleeps four people, with a maximum of six. The condo includes two queen beds, full bath, a living area with full-size sleeper sofa, gas fireplace and 27-inch TV. The Black Bear Condo sleeps six people, with a maximum of eight. The master bedroom has a California king bed with a 27-inch TV. The second bedroom has two full beds and a 27-inch TV. There is a spacious bathroom between them. The living room has a full-size sleeper sofa, gas fireplace, 42-inch TV and a balcony or patio. There is also a full kitchen with breakfast bar. The Wolf Pack Loft Condo sleeps seven people, with a maximum of ten. The Kid Kondo has a bunk bed, queen bed and 27-inch TV. The master bedroom has a California king bed with a 27-inch TV. The third bedroom has a loft with a full bed, bathroom and 27-inch TV. The living room has a full-size sleeper sofa, gas fireplace, 42-inch TV and a balcony. There is also a full kitchen with breakfast bar and a dining area. The Timber Wolf Condo sleeps ten people, with a maximum of 14. The master bedroom has a California king bed with a 27-inch TV. The second room has two full beds. The third bedroom has two queen beds, full bathroom, a living area with full-size sleeper sofa, gas fireplace and two 27-inch TV's. The living room has a full-size sleeper sofa, gas fireplace, 42-inch TV and a balcony or patio. There is also a full kitchen and a dining area. The Great Frontier Loft sleeps 11 people, with a maximum of 16. The Kid Kondo has a bunk bed, queen bed and 27-inch TV. The master bedroom has a California king bed with a 27-inch TV. The third bedroom has a loft with a full bed, bathroom and 27-inch TV. The fourth room has two queen beds, full bathroom, a living area with full-size sleeper sofa, gas fireplace and two 27-inch TV's. The living room has a full-size sleeper sofa, gas fireplace, 42-inch TV and a balcony or patio. There is also a full kitchen with a breakfast bar and a dining area. Overall a nice,fun resort. Indoor water park set up very well. Staff friendly and helpful. Hotel room was not the cleanest I have ever stayed in. Mattress very comfortable. Resort restaurants have good food but very pricey. Saturday a.m. sleep was disrupted by grounds work RIGHT OUTSIDE patio at about 8:30 and went on for hours. Seems like something that should have been done during the week or when those closest rooms were vacant. Perfect family place! We stay at GW one to two times a year and absolutely love it! Staff is so friendly and helpful. Food in main restaurant is tasty and the kids love it! Love Magi quest/Shadow quest and the arcade. It's definitely worth it to get the Paw Pass, save a lot of money. Overall a great experience! 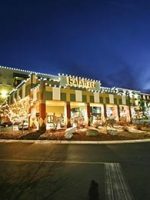 Great Wolf's indoor water park spills across three distinct sections that can be helpful for kids who get easily overwhelmed by one large park. Make sure you scope out the whole place and choose the best features before deciding where to park your towels. The first section, Bear Track Landing, includes a number of slides woven around the Crooked Creek lazy river, colorful totem poles and jumbo whirlpools. Head left to play at Fort Mackenzie, a four-story tree fort topped by a 1,000-gallon soaker bucket. Slap Tail Pond anchors the third section of the park as a zero-entry wave pool. The 3-foot waves are powerful enough to wash a toddler -- even an adult -- back to shore. It's also where the biggest slides can be found, including the 436-foot Coyote Cannon and a four-story, two-lane Mountain Edge Raceway that zips riders on mats around corners before shooting them downhill to a finish line. Fort Mackenzie is a four-story interactive tree house in the center of the water park. There are spray stations, suspension bridges, slides and best of all, a 1,000-gallon bucket that tips over and drenches anyone underneath. Looking for a fast escape out of Fort Mackenzie tree house? 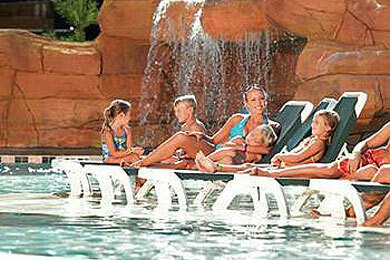 Use the twin three-story Totem Towers waterslides. Kids test their balance, jump on lily pads and try not to fall into the water in Frog Bog Log Walk. Children under 48 inches tall should wear lifejackets. Children under 48 inches tall can slide on the small Hawk's Beak slides. Howlin' Tornado is the most thrilling ride with a six-story funnel that riders swish and swirl around in on a four-person tube before a splash landing. Children must be 48 inches tall to ride. Lookout Mountain is a 200-foot mountain with Coyote Cannon and Whirly Bird Run waterslides that spill into a lazy river. Coyote Cannon drops riders 40 feet into a cannon bowl while single or double riders shoot down the 443-foot Whirly Bird Run waterslide. Children must be 42 inches tall to ride the slides. Ride down this 100-foot waterslide, Mineshaft, with no mat, tube or raft, just yourself with arms crossed over your chest. Children under 42 inches tall should have adult supervision. Mountain Edge Raceway is a four-story waterslide where you can challenge family and friends to a race headfirst on a mat around sharp turns and straightaways. Children must be 42 inches tall to ride. Racoon Lagoon allows little ones to play with spray features, swim in a one-foot deep zero-entry pool and watch a volcano spray water. Slap Tail Pond is a wave pool with waves up to 3 feet tall. It features zero-depth entry and goes up to 5 feet deep. Float on a tube or ride the waves as if you were in the ocean. Children under 48 inches tall must wear a lifejacket. Summer visitors craving sunshine and a big open pool can find it at Thunder Bay, a seasonal 60,000-square-foot outdoor water park. It includes slides, a play area and splash buckets and water basketball. For roughly $5 to $10 a piece, kids can pick out craft projects such as T-shirts, bags and picture frames to color and decorate for a hands-on Great Wolf souvenir at Cub Club. The camp is located on the far side of Magic Quest. It's a good option for younger kids who aren't interested in electronically tracking dragons and treasures. The centerpiece of every lobby is the tree-like clock tower that opens up for an animated story time. An early pioneer and an Indian maiden, along with a cast of critters, sing about the "Rhythm of Nature" in a "Circle of Life" kind of send-up. 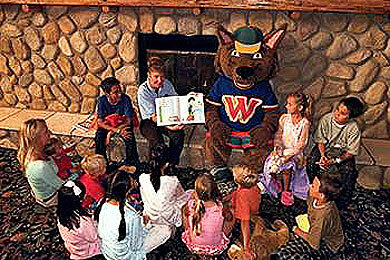 Afterward, a staffer accompanied by a resort mascot (Violet or Wiley the Wolf) will read a story to kids in pajamas. Go early for the best spots on the carpet. During Morning Wolf Walk, staffers take kids on a free educational walk through the resort each morning to talk about the different woodland animals, including wolves, bears and moose. With computerized wands and a book of clues for acquiring runes and solving quests, kids and parents set off on this three-story game. When they solve clues correctly and find the right object, wands open treasure chests, bring paintings to life, illuminate jewels, talk to fairies and slay animated dragons. Each game is $11.99, plus the cost of wands, which run $14.99 to $19.99. Kids may clamor for accessories, too, such as dragon and unicorn add-ons for wands, rune amulets, wand belts, hats and crowns, velvet and satin capes, and other fantastical gear sold here. The game is open to the public, but Great Wolf guests can keep using their wands in the lodge by activating or animating other objects (including a fairy with an attitude) and solving two additional quests. This family-friendly arcade is full of games ranging from games of skill for older ones to games of chance for little ones. Earn as many tickets as you can to turn in for prizes when finished playing. There is a peaceful, aromatic Aveda spa on Great Wolf's lower level that could make any mom happy, but the second-floor Scooops Spa for kids is pretty irresistible, too, as a sweet splurge. And we do mean sweet. The entire salon follows an ice cream fountain theme with round pedicure and manicure scrub balls in vanilla, chocolate or strawberry scents. There's a banana split bench for getting toes all Fancy-Nancy and mini-facials for 'tweens. Spa guests leave with a nail polish kit, tiara and coupon for real ice cream. Scooops treatments are designed for girls ages 4 to 12. ShadowQuest is a journey to save the light. Kids take on the role of the Magi and it is up to them to conquer quests, collect runes and battle the Shadowlord to save the light of the long winter night. 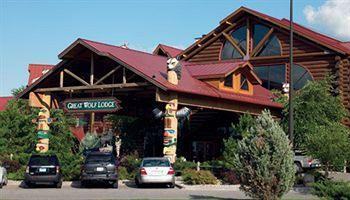 There are several options for dining at Great Wolf, all of which are casual and kid-friendly. While you can't go wrong with any of the choices, don't expect to be wowed by any of them either. Unless you plan to dine somewhere outside of the resort for dinner, leave the skirts and dresses at home, ladies, as well as the ties and jackets, fellas. The Bear Paw sweet shop loads up with muffins, doughnuts, treats and homemade fudge in flavors such as cotton candy and Superman and traditional variations of chocolate. For a nice hot breakfast go to Camp Critter Buffet. It has rustic Northwoods themed dining tents and a buffet. Get made-to-order omelets, wolf waffles, hash browns, bacon, muffins, cereal and fruit. Hungry as a Wolf is a quick and easy lunch or dinner option. The menu includes homemade pizza, bread sticks, salad and a Wolf-It-Down family meal. Order take-out and pick it up at Loose Moose Bar and Grill, then you can take it back to your suite to eat. Specialties for this casual restaurant include a classic ale-battered fish fry, several vegetarian pastas, a roasted half-duck served with a raspberry demi-glaze, and pan-seared walleye with maple dried cherry butter. Most kids would rank dessert as their favorite part of the meal, and the Wiley's Super Duper Campfire Sundae is a show-stopper that needs to be shared: waffle cone logs surround cotton candy flames and six scoops of ice cream with toppings. The water park snack bar serves up the usual hot dogs and burgers, but also some creative, healthy choices such as lodge-made cashew or peanut butter and a banana on a hot dog bun. The menu keeps evolving and may include some more adult-appeal with options such as pulled-pork sliders with coleslaw. They also have added to-go boxes that connect to a lanyard so parents have an easier time getting food to their table. This resort plays up the season it's in, whether it's Fourth of July fireworks, a Labor Day luau or Halloween with costume contests and pumpkin crafts. Consider the special events when planning your vacation dates and be sure to get a resort schedule at check-in with the lineup of special activities such as karaoke night by the pool, beach contests or trivia games. Guests can arrive as early as 1 p.m. and get water park wristbands or head to Magic Quest. The staff will call your cell phone when a room is ready. Check out is at 11 a.m., but guests can take a beach bag or rent a locker to stay the rest of the day at the water park. Families who want to avoid crowds and enjoy better rates can find them early September to mid-October. April and May also are ideal times to go as the weather gets balmier, but summer crowds have yet to arrive. While it may not be the quietest month, guests rave about December with the Snowland decor that turns an already whimsical lobby into a full-blown North Pole. 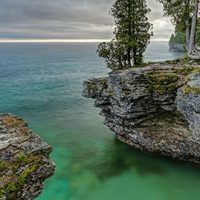 The resort is right off Interstate 94/90, about 90 minutes hours from Milwaukee, 3.5 hours from Chicago, and four hours from Minneapolis-St. Paul. There is an Amtrak station in town and local taxi service for reaching the resort. Guests arriving by plane need to rent a car to reach Great Wolf. An adult spa is also on premises with massages, skin treatments, nail services and a hair salon.